This Atlas map shows that Kingfishers were found in one-quarter of the county’s tetrads, slightly fewer than during our First Atlas. It is not easy to assess how much the results from this three-year survey would be expected to differ from those of our seven-year First Atlas, but a longer survey would surely have increased the proportion of two-letter codes. Many records of Kingfisher require an element of luck and ‘being in the right place at the right time’, especially in proving breeding through the serendipity of seeing an adult flashing past carrying a fish for its chicks, which is the way that breeding was confirmed in 21 of the 38 tetrads. In seven cases observers saw recently-fledged young. Many fieldworkers would envy what Ann Pym described as her ‘magical’ experience whilst recording near Swettenham (SJ76Y), when she was able to watch two fledglings from 10 yards away, one trying its fishing skills and the other loafing on a branch, just above the water. Kingfishers have a long breeding season, from March to July, with most pairs having at least two broods and raising an average of 6.5 young per year (Brown & Grice 2005): this high reproductive rate allows them to bounce back from dips in their population, most of which follow hard winters. Surveyors found nests in ten tetrads, although most fieldworkers only came across a nest by accident, whilst walking along a stream, and were aware that deliberate disturbance of Kingfishers at or near their nest is an offence against the Wildlife and Countryside Act (1981), as the species is specially protected under Schedule 1. Two Schedule 1 licence-holders have opposing opinions of the fortunes of Kingfishers in Cheshire. One feels that they are doing well, although certainly under-recorded, while the other holds the view that in east Cheshire they are threatened especially by man’s activities. It is not difficult to reconcile these views from looking at the ‘change’ map and dividing the county east and west of the northing 60 line. To the west of this line, the species has been gained in 33 tetrads and lost from 23, a net gain of ten, while to the east, there are 41 gains and 78 losses, a net loss of 37 tetrads. The reasons for this division are not clear, however. This always has been a scarce bird on Wirral, and those recorded during this Atlas were the first since 1995 (CWBR) but the present position on the peninsula is almost the same as that found twenty years ago. Kingfishers establish their territories along stretches of running fresh water which is unpolluted, shallow, translucent, partly shaded and not turbulent, with reedy or woody cover at the edges providing plenty of low perches. They feed on minnows, bullheads, roach and other fish 3-7 cm long; occasionally a good feeding area does not contain a suitable vertical face in which they can burrow their nest, so they sometimes fly some distance from the nest, perhaps across dry land, to get food. Not surprisingly, all of the habitats used contained freshwater, with some observers adding extra habitat codes for the surrounding farmland or human sites. Streams (28%) and rivers (21%) account for almost half of the records, with 18% on lakes/ reservoirs, 11% on small waterbodies and 11% on canals. In total, 62% were on linear watercourses and 38% on areas of standing water. 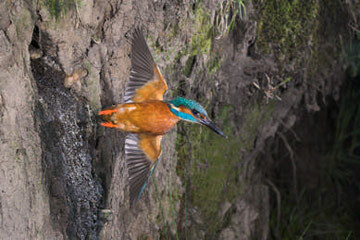 They cannot fish well in fast-moving water, so some of the upland rivers are unoccupied, and most Kingfishers are in the lower-lying parts of the county, but they were present in 20 out of the 103 tetrads above 100 m, not significantly different from the proportion at lower altitudes. The status of the Kingfisher in Britain seems to be reasonably secure; it owes its place on the Amber List of species of conservation concern to a drop in population across Europe as a whole during 1970-1990, but the British total has risen since then and now appears to be stable. The county breeding population is likely to be around 150 pairs.